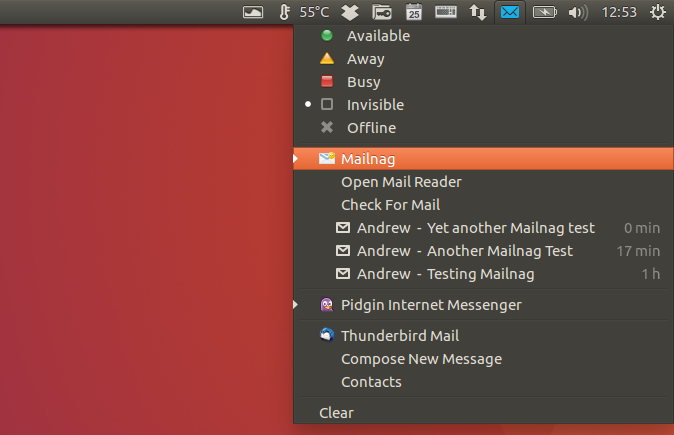 Mailnag is a desktop-independent email notifier for Linux. The application supports both POP3 and IMAP servers and on email arrival, it performs various actions like visual or sound notifications, allows executing a script and more. For Unity and GNOME Shell, there are two Mailnag extensions that further integrate the application with the desktop. 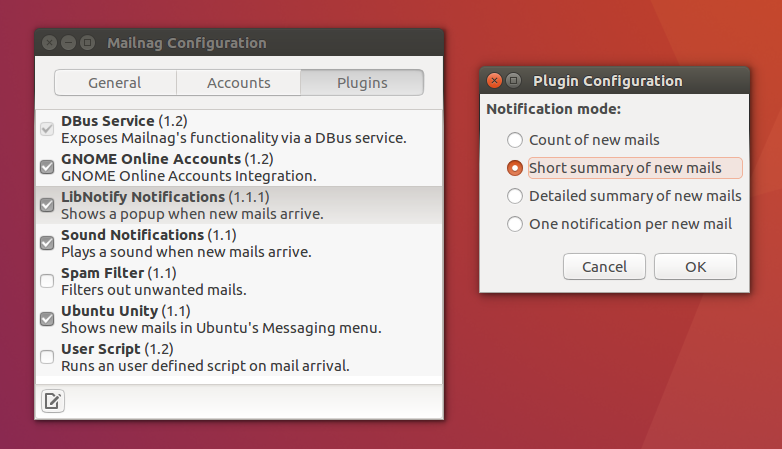 Using the Mailnag Unity plugin, the application integrates with the Messaging Menu, while using the GNOME Shell plugin makes Mailnag available on the top panel, and it includes an email counter and popup menu (updated with the latest 1.2 version), which you can see below. There's also a GNOME Online Accounts plugin, which makes Mailnag aware of email accounts specified in GOA (this doesn't work with the forked Unity Online Accounts). various other improvements, fixes and updated translations. 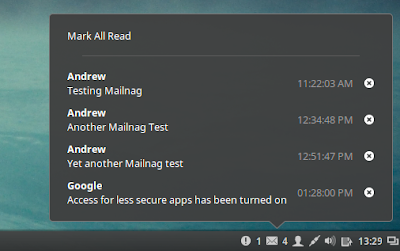 Gmail users: It's important to mention that on non-GNOME 3 desktops, like Unity, in which you must add your Gmail account directly in Mailnag, the application might not work out of the box because Google may block it for not using modern security standards. One way around this would be to have 2-step verification enable and add a password for Mailnag as described HERE. Another way is to visit THIS page and turn "Access for less secure apps" to "on". Obviously, this isn't the best solution, so use it at your own risk! More information about this option, HERE. Mailnag does come with an option to store the password in the GNOME Keyring (it should work by default but if it doesn't, you can change the "ceditentialstore" from "auto" to "gnome" in ~/.config/mailnag/mailnag.cfg) so it's far more secure than say, Pidgin, which stores the passwords in plain text (by the way, HERE's a plugin for that adds GNOME Keyring support to Pidgin). And finally, yet another way is use the GNOME Online Accounts (don't confuse this with the Unity Online Accounts!) 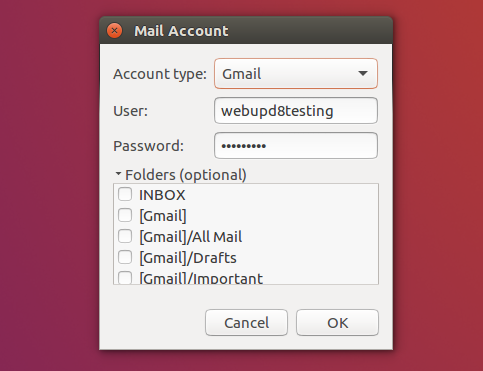 to add your Gmail account, even if you don't use GNOME 3 / GNOME Shell. 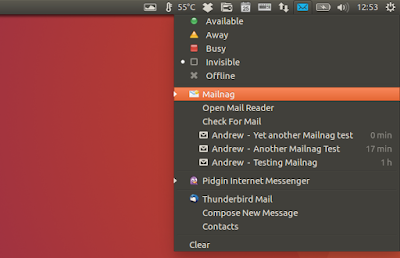 Note that Mailnag is also available in the official Ubuntu repositories, but it's an older version. Also, the Mailnag Unity plugin is not available in the official repositories. After installing the GNOME Shell extension, use GNOME Tweak Tool to enable it (you may need to restat GNOME Shell or log out and log back in to see the extension in Tweak Tool). For Cinnamon, you can install the Mailnag panel applet by right clicking the panel, then select "Add applets to the panel" and on the "Available Applets (online) tab, search for Mailnag and install it, then switch to the "Installed applets" tab to add it to the panel. 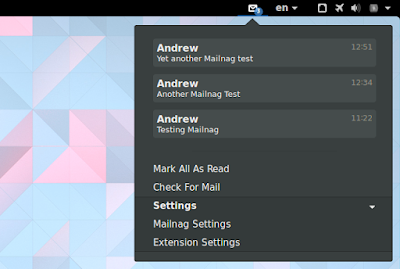 Once you install the packages for your desktop, launch Mailnag Config and set up Mailnag. Arch Linux users can install Mailnag via AUR: mailnag | mailnag-gnome-shell | mailnag-goa-plugin.